It’s 2019 and unequal pay is still a major problem. There’s even a day dedicated to it—Equal Pay Day, which falls this year on April 2nd and marks how far into the year women must work to make the same amount men made the year before. (On average, women make about 80% of what men make in the same roles.) Even though pay inequality directly impacts your livelihood if you’re a woman, you may feel helpless to do anything about it. But there’s one way to take action: find out if you’re making less at work than coworkers doing similar jobs. Though it may sound uncomfortable AF, one of the best ways to secure this knowledge is to talk about your paycheck with your colleagues. Since we’ve all got different communication styles, we spoke to three different experts to get their perspectives on how to broach this admittedly awkward convo: career coach Ashley Cash; women’s financial empowerment coach and motivational speaker Kathlyn Hart; and founder and CEO of the professional training and coaching company The Memo, Minda Harts. Each woman provided valuable insight on how to get this conversation going—and what to do with your newfound knowledge once you know what you’re being paid compared to your colleagues. 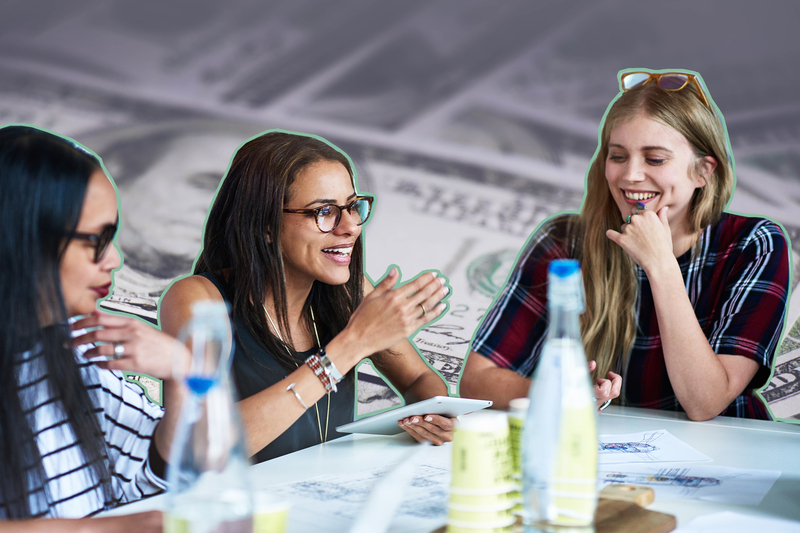 So feel empowered this Equal Pay Day (or even get a confidence boost) with these tips on how to start taking steps to get what you’re worth. Hart: When trying to figure out if we are making less than a fellow coworker, we often want to start the conversation by asking how much they make. Instead, we want to first get their buy-in to have this conversation and establish trust. For example, you could say, “Hey ____, I was thinking about my salary a lot, especially with Equal Pay Day here. I was wondering if you would be open to me sharing my pay with you to get your opinion of if I’m being underpaid?” Notice that you aren’t jumping straight into the conversation or asking them to reveal personal information. Instead, you are asking for their permission and their opinion of your salary. This will create more trust with the person you are talking to and make it more comfortable for them to share as well. Harts: Whatever you do, don’t make it weird—ease into it. The first time I found out what my colleagues were making, it was over lunch. The conversation about annual reviews came up and one colleague asked if x amount was too much to ask for. That opened up the conversation, and we all found out that we did the same work and were not being paid equally. How can you make it less uncomfortable? Cash: Acknowledge that this isn’t exactly a happy hour topic and give your coworker a second to respond. Then, take the “I’ll go first” approach (heck, you could be making more than them). You can say something like, “When I first started working here I had no idea that it would be this much work, especially for the pay. If I share my salary range with you, are you comfortable sharing yours with me? I promise to keep this conversation between us. I would never mention your name in a discussion with [boss’s name] or anyone else.” When you share your salary range, use a small range e.g., $50-$55K. Are there certain coworkers you should talk to first? Cash: First, definitely start with coworkers who you have a good relationship with and ones who you trust would be honest with you. Try and ask coworkers who have the same role as you, but be mindful if you guys started around the same time, depending on budgets during that exact time, you could be making more or possibly less than coworkers who started before or after you. You can also ask coworkers who are no longer in your role (due to promotions, lateral moves, left the company, etc.) about their old salary. You’ll find that people don’t mind telling you what they used to make. Hart: Before talking with a direct coworker, I would actually recommend that you talk with coworkers that no longer are with the company. A former coworker will be much more willing to share what they used to make and will also have great insights into what salary looks like at other companies. After, I would talk with a mentor within the company that is more senior because they will be more likely to have a realistic overview of what you could make, plus give insights into the next best steps to take. Only after exploring these two options would I recommend talking with a coworker that you trust about your pay. Harts: I would advise starting with the people who are on your team or perform the same function. They would be able to give you the best intel. Or, if you are interested in seeking a promotion, do some informational interviews with your colleagues and ask them about the salary range for the position. How do you avoid hurt feelings? Hart: Start by asking permission to have the conversation first. For example, “If I share my salary range with you, are you comfortable sharing yours with me?” If they say they aren’t comfortable, acknowledge that it is absolutely a sensitive and personal subject and that you won’t bring it up again. If they are upset, sincerely apologize and ask to change the subject. Harts: It’s okay to be upset, but let that fuel your desire to be your best advocate and seek out the information you need to ask the right questions that lead you to negotiate your worth and ask for more. You will have to divorce your feelings. Do you need to worry about repercussions from your boss? Cash: BIG NO! As you close out the conversation, agree to keep the conversation confidential. If somehow your boss finds out, just reiterate that you wanted to be prepared and informed before speaking with him/her. Explain that you work hard and you wanted to be certain that your compensation matched your contributions. Researching or understanding how your salary compares to your peers is nothing to be scared of or be sorry about. Hart: It’s natural to feel nervous about repercussions from your boss, however, if you approach it in a professional, non-gossipy way, you have nothing to worry about. It is your right to understand how you are being paid and to know whether or not you are being underpaid. How much should you consider different educational and professional backgrounds? Cash: The best thing to do is compare the data you gathered from coworkers and/or your network against market value data from sites like Glassdoor or Salary.com. There, you can input factors that influence salaries like years of experience, education, certifications, etc. Keep in mind your coworkers’ salaries are an indication of market value at the company you work for. Say you talk to a few coworkers and find out that you all make about the same, but later you do your industry research and find out you’re all making $10K less than the company average. That’s why you want to know how your compensation compares to the industry, because if it’s lower than the average, that means you might be able to make more money somewhere else. Finally, what should you do with the information that you’re being paid less if you find that to be true? Cash: Now you’re ready to have an informed conversation with your boss. Ask for a meeting to discuss your performance and your salary (schedule a meeting rather than just popping into his/her office). During the meeting, raise a few points about the work/projects you’ve done well and let your boss know you’ve done some research and concluded that you might be underpaid for the industry. Ask if you can discuss increasing your salary to the industry average. Use the knowledge obtained from your coworkers to determine if your new salary offer is in line with your peers (that’s your minimum). Your target is the industry average. Bottom line, your coworkers’ salaries are a great way to know where you stand among your peers, but if you really want to be paid fairly and what you’re worth, focus on market value for your industry, in your city, with your experience, education, and/or certifications. Hart: If you find out that you are being paid less than you should, then I suggest you connect with former coworkers, mentors, or coworkers you trust to learn about how raises are handled within your company. Each company is different and unique, so it’s always best to learn from people who are familiar with the company to determine what your next step should be. Harts: I think we have to learn to practice transparency—even though typically many working environments have not given that to us. Approach your manager with the facts, not from a place of “pay me what you owe me” in a Rihanna type of way, but positioning it from a place of providing solutions. In this conversation, you don’t have to throw any of your colleagues under the bus, but present the new facts of the pay gap within the role that you hold and that you would like to discuss ways to close the gap. If you sit with this information too long and do nothing with it, eventually it will affect your work, and it’s best to deal with the situation after you have gathered all the facts.